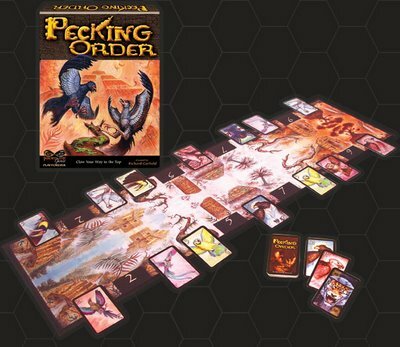 The very first game in the Immortal Eyes games line is Pecking Order, a new game from Richard Garfield. Piercing the mists of a vine-choked jungle are the ruins of a lost civilization. Soaring above the scene, and amidst its crumbling sites, are powerful birds. Intelligent, determined, cunning and fierce... the two clans of rain forest avians vie for power, for control of the Pecking Order. What man has lost and forgotten they struggle now to claim. In this place, out of time and out of memory, a fierce battle is about to be waged. You and your opponent will determine the outcome. Victory will come to the clan which best balances strategy, luck, position and guile. Pecking Order is a simple game with subtle depth. The rules are learned within a few minutes. The first game is completed in less than an hour. Yet, despite this seeming simplicity, each time you play you will learn more about the game, your opponent and what you are capable of. Pecking Order is the perfect game to â€œwarm upâ€� with prior to playing more time-demanding games. A full game of four rounds takes 30 â€“ 45 minutes; a single round can be completed in just ten minutes. Pecking Order is also suitable for tournaments thanks to its fast play and competitive scoring. Enjoy! A quick and strategic two player game. This is game with simple rules, but complex play. The game play is quick, which means you will end up playing several games in a row. This is essentially a card game, but the components are nice and the gameboard is a nice addition. Pecking Order is a great little filler game. It plays in 15-20 minutes and provides lots of tactical choice and bluffing. It reminds me a bit of Lost Cities, but with much less luck and an even faster playing time. It's a bit like Lost Cities but with much less luck and even shorter playing time. It is also more portable and is the perfect game to bring to a café or bar.